The parents who have twins and same-aged 2 children they can use the double strollers. Still, worry about the weight of the stroller because pushing or struggling with a stroller for the whole day and then fold it and looking after both kids at the same time all these can make you upset. For this reason, the lightweight double strollers are most required items. Most of the lightweight double strollers available on the market weight around not more than 30lb. There are some exceptional available which are little heavier than others and you need to select such a lightweight double stroller which will last for a long time. 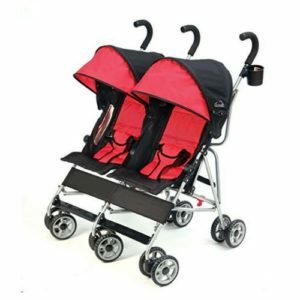 What type of stroller do you want tandem style double stroller or side by side double stroller? Are you going to use the stroller very often or just occasionally? If you have an infant and an older kid you need to make sure, that is the stroller capable to handle their weight? Do you require infant car seats for both front and rear seats? Which aged kids are going to use the stroller? Are they both infant or twins or one infant and one toddler? Actually, there are lots of things to consider before buying a stroller for your kids. Which type stroller will fulfill your needs that will depend on your own situation? You need to think first how are the stroller going to be used very frequently or occasionally for an adventure. If you have twins or 2 same aged newborn kids then you need to buy such a stroller which can do both seats accommodate newborn car seats. Similarly, if you have an infant and a toddler then you need to check the maximum weight limit of the stroller. These are most important factors to think before buying a stroller.Mainly there are three types of double strollers. These strollers are quite common for a double stroller and this stroller features with two same type of seats with the same amount of rooms and facilities. In these strollers, the seats are close to each other. These strollers are easy to move compared to inline strollers. Sometimes inline strollers are difficult to turn. For side by side strollers sometimes it is difficult to get through a narrow door entrance and passageways. According to name, these strollers are easily convertible. These strollers can be used as a single stroller or a double stroller by just adding another seat. If you want you also can handle the third one. Your older one can sit on the bench or can stand on the standing platform. This is a great stroller for your growing family. In this styled stroller, the seat comes one after another in a line and both seats are the same height. These design strollers, the rear seat raised up a little bit higher than the front seat for better watching which is known as stadium seating. Though both seats don’t come with same facilities and the same room, one seat offers more leg space and may recline than another one. It is hard to turn around because these are long in size. Now it’s your turn to decide which double stroller you need for your family. 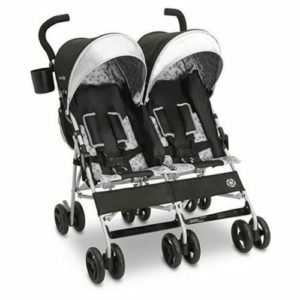 You can have a look at our list for the best lightweight double strollers. Do you have 2 children of same ages? Are you thinking of how to manage? Don’t worry we are here to help you. The Kolacraft Cloud side by side double umbrella stroller has some amazing features that you will like it. It comes with lots of amenities for the parents who have more than one child. It is developed with independently reclining seats, compact folding, double umbrella and inflatable canopies. Kolcraft Cloud Side by Side Double Umbrella Stroller is quite reasonable in price. I think you will get it at your budget. It featured some outstanding luxury facilities for your kids. It is quite big in size. Maybe you will be able to manage your both children easily by using just a single stroller. Compare to other strollers it is a money worthy stroller. The Kolcraft Cloud Side by Side Double Umbrella Stroller is a huge sized stroller as I mentioned before. Since it is double sized stroller so it is normal, it will be bigger than the single strollers. A bigger size stroller must be heavier in weight. But it is quite easy to move and it provides enough space and maximum comforts for your kids. Sometimes it can make you feel annoyed because if you walk into a narrow place or a narrow door pathway then it is difficult to handle but you can ignore these problems because of your kids’ comforts and facilities. Kids’ priority is always first. 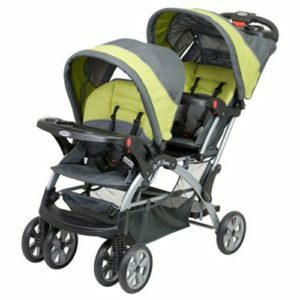 This a lightweight double stroller compared to other strollers. This is only 21lbs which is good enough to travel with your kids. Though weight can differ from product to product and It has maximum weight limit 35 pounds for each seat. It is wider in size so it is sometimes annoying while you are passing through a small place or narrow footpath. 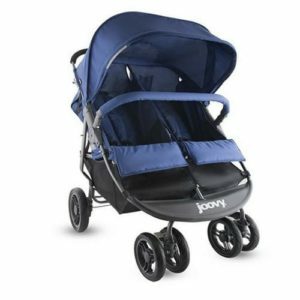 The Joovy Scooter X2 Double Stroller has developed a new entry to the side by side double strollers’ world at a reasonable price. The stroller is lightweight and nice design also can move through any door without hassles plus sufficient room for your kids. The stroller’s width is 30” so you don’t need to bother to fold it while getting inside a door. The Scooter X2 stroller features stylish graphite gray frame and big wheels. The front wheels are 7 inch and rear wheels are 9.5 inch which makes the stroller more special to move easily than before. The entrance wheels are double and these make the stroller more steady and balanced. The wheels come with a sealed bearing so it can carry up to 90 pounds easily which is really great you don’t need to think much about the weight limit. Compared to other strollers in the market, the basket is quite bigger and the cover is large as well. Both seats are easily adjustable and very comfortable for your kids because both seats have the one hand recline system which you can control by locking in different position. So your kids will be fine at nap time. Both seats come with the adjustable 5 point harness and personal seat mesh pockets. It also has 2 big cup holders for the parents and two zipped lock pockets to keep your keys, phones, wallet etc. The stroller features sealed bearing wheels which make the stroller to move easily and in this stroller, there is a parking brake available as well. 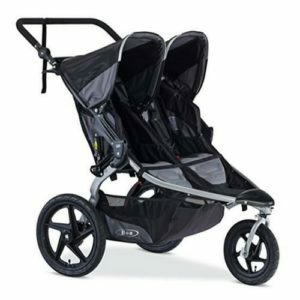 The J is for Jeep Brand Scout Double Stroller is from the famous company Delta Children which is quite popular for their baby furniture, maternity items, cribs and baby strollers and the provide best quality baby products. If you have twins baby or same aged 2 babies then a double stroller is the most important item of your growing family. The J is for Jeep double stroller comes with lots of features and facilities which can ensure your lifestyle easier with your kids.The J for Jeep double stroller features reclining seat with maximum comfort for your babies and also has big storage basket for your baby’s items, durable wheels and lots more. The stroller is perfect for you 2 little toddlers. It is suggested for kids’ up to 35lbs each. This double stroller is comfortable and safe for your kids. The stroller contains spin suspension for front wheels which can provide you smooth and comfortable movement. It is a lightweight and stylish stroller and you can use it to move anywhere you like with your little tots and enjoy your parenting experience without any difficulties. The stroller has 2 color choice options so you can select your favorite one. It maintains all the safety standards. The stroller has 5 point harness for your kids’ protection and safety. The straps are padded at shoulder for your kids’ comfort. This stroller can move through 30-inch entryways so you can take the stroller easily anywhere you like such as footpaths, narrow passages etc. Do you have any experience to have a cheap low-quality jogger? I have a horrible experience and don’t want to compromise with money anymore. It was far beyond of my expectations. I had no option without a double stroller because my little one was 3 months old and the older one was 25months old. I checked some customers’reviews and picked the Bob Revolution Flex Duallie Stroller and which was great. The price is bit expensive but great features for the price. It is an amazing stroller for your kids. 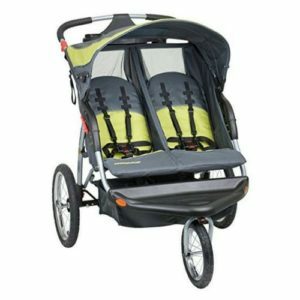 It is a lightweight double stroller and very smooth moving. You can fold it easily just by using simple two steps. It can fit your car and trunk without any difficulty. The handlebar of the stroller is easily adjustable according to your height. This is one of the popular features for most of the customers. 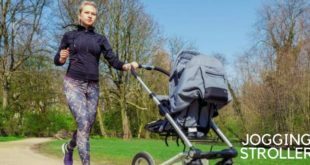 The Revolution FLEX Duallie Jogging Stroller is an amazing stroller. You can manage this stroller easily because of its lightweight and it moves smoothly at any rough or plain terrain. It comes in 4 different colors in beautiful design so you can choose any color you like. This is a side-by-side double jogging stroller. The tires of the stroller come with inflated rubber, easily adjustable suspension; the front wheel with swivel locking, the handlebar can be adjustable with your height, you also can take one infant car with this stroller. The seats have freedom of reclining at any step from sitting to nap time. It contains a large storage under the seats to keep all the necessary items for your kids. There are 2 pockets at the back of the seats. The canopy provides maximum sun protection and it also comes with 2 windows for 2 seats. The seats are comfortable enough for your kids. The stroller is designed to carry 2 kids with maximum weight capacity 50 pounds each seat so total capacity is 35pounds to 100 pounds. The large storage basket provides some more extra spaces for you so that you can take everything you need while you are going out with your kids and both seats contain 2 large pockets or keys. Phones, chips. Drinks etc. The seats are well padded and come with 5 point harness for kids comfort. It is a high-quality stroller and the durable frame material makes it long lasting. The Baby Trend Expedition Double Stroller can be a perfect option for the parents for their toddlers at a reasonable price. The stroller is quite good looking fashionable side by side stroller. It structured with three wheels design and the wheels are air-filled rubber wheels which make the stroller easy to move for almost all terrains. Compared to other strollers this is a budget-friendly side by side stroller which provides plenty of features with good customer’s reviews. It is quite lightweight stroller and can go almost all doorways easily. This is an easily foldable stroller. It gives the opportunity for jogging and you can push and turn smoothly. It has large storage chamber under the seats for the essential kid’s items. The seats are independently reclining with the great ventilation system. The stroller comes with 5 point harness which is adjustable for different sized kids and it makes sure their safety while your kids are staying in the seats and you are quite busy with jogging. There are also 2 drinks holders for the parents and the stroller weight capacity is up to 50 pounds for each child which is more than enough. If you want you can remove all the tires quickly and you can store it in a small place such as cars, trunks etc. The Baby Trend Expedition double stroller introduced an amazing feature to entertain your babies. There is a built-in MP3 speaker attached with the canopy, so your babies can enjoy their favorite music while you are busy with jogging. The speaker has a jack which is compatible with many devices like iPod, iPhone, MP3 players etc. Maybe you are looking for a double stroller with maximum comforts for kids, easy to move and turn. To look for the best stroller for your loving family is not an easy job. There are plenty of options on the market and among these, it is quite a hard task to find your desired one according to your budget and requirements among thousands of options. 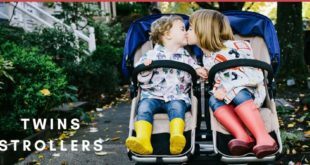 Before buying a stroller you can research the customers’ reviews and features and I think the Baby Trend Sit N Stand Double stroller is a lightweight, durable and comfortable stroller.This is one of the best double strollers. This is good in quality and comes with lots of features. Sit N Stand the name states the feature of an outstanding platform where your toddler can stand. You can fold the stroller quickly just in one step and you can accommodate two newborn car seats as well. This Sit N Stand stroller has a unique feature which is your older toddler can stand at the standing platform or can sit in the jump seat and when your baby needs to take rest can seat into usual stroller seat. The seats feature with 5 point harness for your safety also comes with foot activated parking brake.This stroller is not very wide like side by side stroller so can go through all type of doorway. If you have one younger child and one older child then your younger child can sit at the front and the older can sit at the rear or can stand on the standing platform. There is a built-in drinks holder for the parents and a small chamber on the tray so that you can keep your phone, keys etc. Finally, most of the parents have the experience to struggle with a too heavy stroller. Maybe you are trying to move and turn in a public place quickly or you are traveling by bus, train or plane wherever you are you just need a lightweight stroller for your family which is strong enough durable and easy to transport from one place to another. 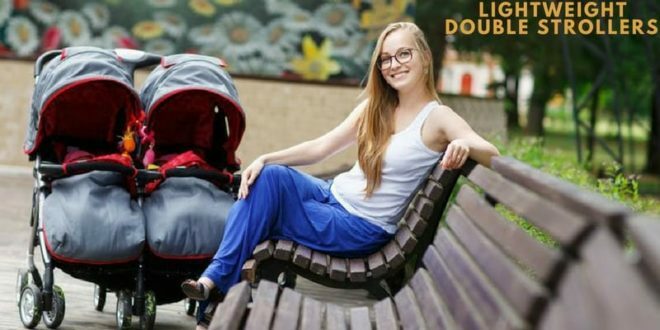 There are lots of choices on the market but in this article, I have tried to provide a brief description with features of some best lightweight double strollers for your kids. All strollers from above lists are best lightweight strollers for toddlers. According to customers reviews, features and performance all these strollers are top rated strollers so you can choose one from the list which fulfills all your requirements and fits your budget. Enjoy your shopping and good luck!